Thank goodness we have have some unprecedented warm weather for April, which means we get to spend more time outside than inside. Now the access to ‘outside’ is the reason why we bought 1 Beechwood last year. We wanted the ability to live outdoors a little more. Although we still have a fair amount of work to do outside, it is already far more comfortable than inside at the moment. 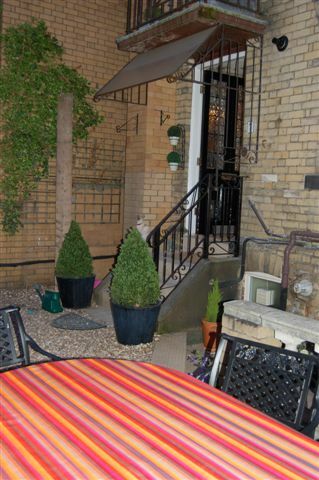 Here is our private entrance and small patio area outside. It is a communal area, so everyone has the right to use it, but as it is so close to our front door it is just more convenient for us, than for any of the other residents. Also, we’re paying for the development of the area. We have already had 2 braais (BBQs) this year – last weekend and this weekend. Now it might also have a little to do with the fact that we don’t have a kitchen … and we haven’t had a one for 7 weeks … and we won’t have one for another month! Below you can see (left) the sink area in the kitchen area which is still usable and (right) the hallway area which we have been using as our kitchen for the past 7 weeks. The dresser covered by a dust sheet contains crockery, cutlery, a kettle and toaster. Behind that we have a fridge/freezer in (almost) perfect working order in spite of it being about 20 years old. 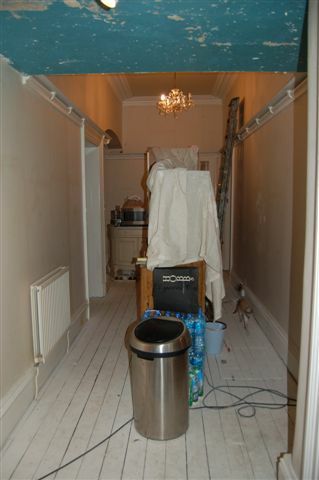 Right at the back we have a cupboard with a microwave on top of it. Before we lost the kitchen we filled up a (new) freezer, which lives in the garage, with the results of our big ‘cook-up’. We thought at that time that we would only be without a kitchen for 6 weeks in total, but luckily there were more portions of ‘chicken surprise’ and bolognaise than we anticipated, so we are still self-sufficient for a few weeks yet. We did have a nasty scare about 2 weeks ago though. We noticed that there was no power to our freezer. In fact, there was no power to the garage at all! It was weekend, so we had to wait for the builders to come in the next day. Luckily everything was still well frozen. Scary thing is though – we calculated that the power was lost quite a few days before, but thank goodness the new freezer was extremely efficient – even without power. It hadn’t defrosted at all. If it had, we would have been in serious trouble … and the local take-aways would have made a lot more money out of us! News in the house: Chris, the decorator, stripped the hallway only to find the original paint the house must have been painted 100 years ago! I thought it was pretty fantastic. For a very short while I was tempted to keep it … and turn it into a ‘junk style’ room, but Tim thought it was a bad bad idea. Besides, not the whole area was painted because of the changes made to when the building was converted to apartments. But it was pretty impressive. 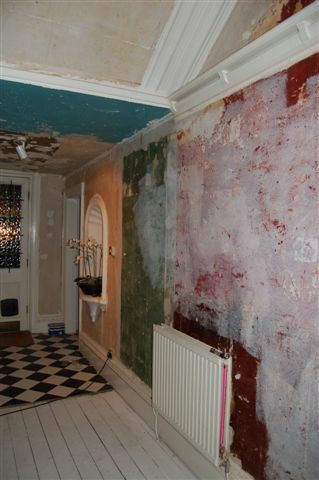 It also gives you a good idea of what the original house must have been like. The builders haven’t been here for the past week. 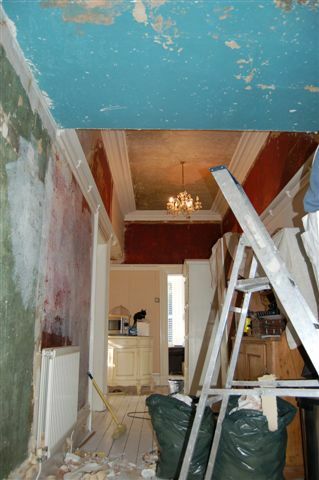 They had some work to finish on another job, but they ought to be back in again on Tuesday. Things are coming along. In spite of the fact that things still look very untidy and in a mess. For example, this is what the master bedroom still looks like. But in fact, there isn’t much to do in here: skirting boards to be matched, light fittings to be changed, carpet to be put down, en-suite bathroom to be completed: lights to be installed, shower door to go up, mood lighting to be installed, door frame to be made, toilet to be connected, final 3 tiles to be cut and extractor to be fitted. Sounds like a lot, but the hard work (the stuff you can’t see) is now all done. We are so looking forward to a finished house! There is still a good few weeks’ work to be done. 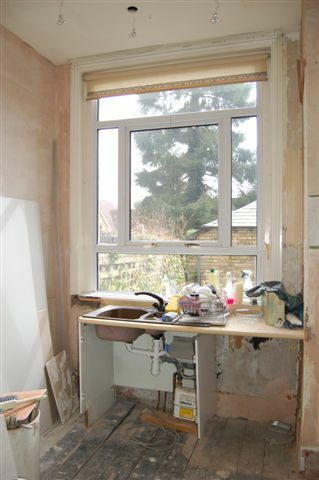 The kitchen goes in on the 30th April and should take about 2 weeks. During those 2 weeks we hope that everything else will be completed. One of these days we should be able to entertain visitors again!